Just a quick, happier, update after the previous sad post. Turns out rats are harder to acquire than I'd expected and for a day I thought I might have to go to a breeder in my home town. Though if you want to buy a lizard there are a few places hereabouts that can help. I did manage to find one pet shop on this side of the city which sells rats. It is 2 bus journeys away, though only 20 mins by taxi. Ty Lee was very curious about me in the pet shop, climbed over the pet shop lady's hand and actually managed to briefly get on to the floor. She enjoys climbing, moving quickly and getting out of your grasp (hence the slightly awkward picture). If you have seen Avatar: the Last Airbender you will understand that she is well named. Mai is more laid back, and seems content to hide or stay in one place unless she feels she wants to move. I chose her for the distinctive forehead marking. She likes certain safe spaces and though she's getting more friendly with us. 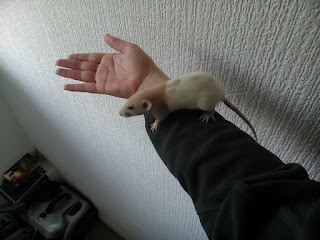 I don't expect her to be sarcastic like her namesake, but I don't know whether rats get sarcastic or what that's like. They are only 9 weeks old at the moment and are basically the size of mice. 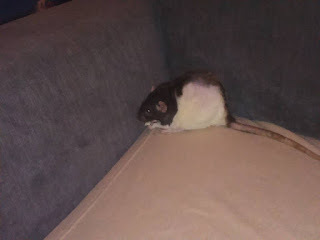 My husband used to call her licky rat, but her enthusiasm for grooming us has reduced since she lost her friends. We're trying to make a fuss of her while she's on her own, but sometimes it seems that she tolerates our attention. We are big and weird and probably don't understand social niceties. The new ones will be in quarantine for another week, then it will probably take a few more weeks of introductions before all three can share the big cage. Even starved for company as she is, Micassa is used to being the boss rat and she's currently twice the size of the other 2, so we have to be careful that the introductions (and inevitable fights) happen under supervision. 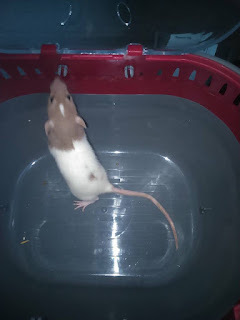 We are also now the proud owners of 4kg of rat and mouse food and 50ltrs of paper-based, eco-friendly cat litter, which is also suitable for rodents. Seemed best to get supplies delivered so we'll be covered even while we've got 2 cages.